These holiday jumbos are my favorite cookies of the moment. I haven't been able to stay away from them since making a batch just before Christmas. 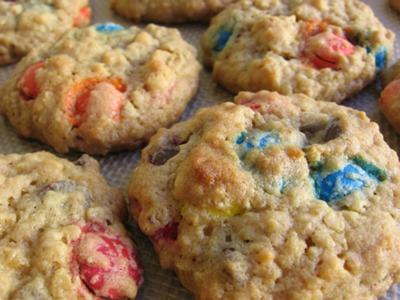 They're like all my favorite cookies - chocolate chip, peanut butter, oatmeal and M&M combined into one! The recipe is from one of those little paperback recipe booklets you find at the supermarket checkout and is a real keeper. Making Christmas cookies is one of my favorite holiday traditions. 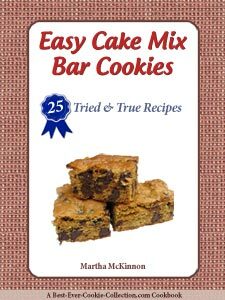 I love to spend several days making an assortment of family favorites and usually spend a day baking cookies with my dear friend Beth. Unfortunately, family illness kept me too busy for my usual cooking baking activities this year. But instead of abandoning homemade cookies altogether, I decided to squeeze in a morning of shortcut cookie baking instead. 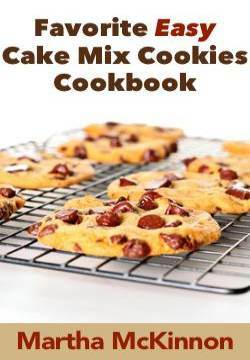 I made three batches of cookies using cookie mixes and cake mixes that were incredibly fun and easy to make. Of the three kinds I made these were my favorites. They stirred together in minutes and baked up soft and chewy. They would have looked more festive if I had used red and green M&Ms, but I used multi-colored instead, since that's all that they had left at my local grocery store. These would be fun cookies to make with different colored candies for other holidays too. You could use red, pink and white for Valentine's Day, or orange, yellow and brown for Halloween. I used Betty Crocker cookie mixes for these cookies. 2. 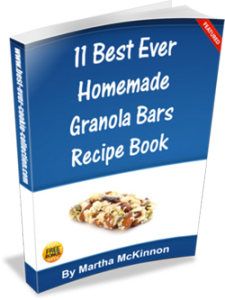 In a large bowl, stir together the dry cookie mixes, oats, butter and eggs with a spoon until well blended. Stir in the candies. 3. Place dough by heaping tablespoonfuls spaced about 2 inches apart onto ungreased cookie sheets. 4. Bake until light golden brown, 12 to 15 minutes. Remove from the oven and cool for 2 minutes and then transfer cookies to wire racks to cool completely. 5. Store completely cooled cookies tightly covered at room temperature. Quick and easy. Perfect when you're short on time. I love anything with M&Ms in them. Join in and write your own page! It's easy to do. How? Simply click here to return to Share A Recipe.